In the preceding chapter Jesus had just finished silencing the Sadducees and Pharisees. At this point all Jesus’s opposers realized that challenging Him would mean public identification of their hypocrisy (see extra credit below). In the wake of their silence, Chapter 23 then is a clear warning to all, in their presence, not to follow them to hell (Matthew 23:15). Jesus warns us what to watch out for, how to identify them. Jesus tells us that they are all about profession; religious dress (Matthew 23:5), exalted places (Matthew 23:6), and phony titles (Matthew 23:9), but lacking true saving faith. Jesus then proceeds to indict them with eight specific accounts of their spiritual bankruptcy; the eight woes of the Pharisees. In Mastering Self; to Lead Self and Others, Chief Hanna, holds that a Christian’s challenge in mastering self is to overcome our inherited corrupt nature expressed through the metaphors of the Pharisee, Philistine, and Pagan. He goes on to define: the Pharisee is preoccupied with pride and pretentious performance: hypocritical religionists with rules, rites, and rituals; Pagans are preoccupied with pleasure and all its passion and preference; Philistines are preoccupied with possessions and pursuits that do not edify. Discrimination, discernment and discretion or put another way; identification, understanding the truth, and freedom to chose life, are offered as the tools we need, and have in Christ, to overcome these destructive tendencies. God would you help us to identify the deceiver’s lies, know your truth, and chose life? God would you empower us with Your Spirit so that we can live victoriously? We ask this in Jesus Name. Thank you God! You are good! Amen! The Coin. 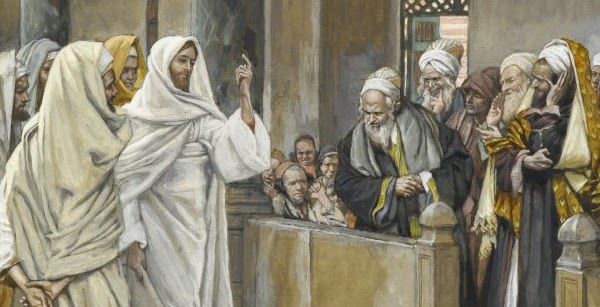 In the previous chapter several religious leaders challenged Jesus in the temple. It didn’t go so well for them. In fact, they were completely silenced (Matthew 22:46). Render unto Caesar that which is Caesar’s is possibly the most notable response in these series of challenges. The more we dig into history the more we can understand the implications of this public exchange. Just a few observations here to pique interest. 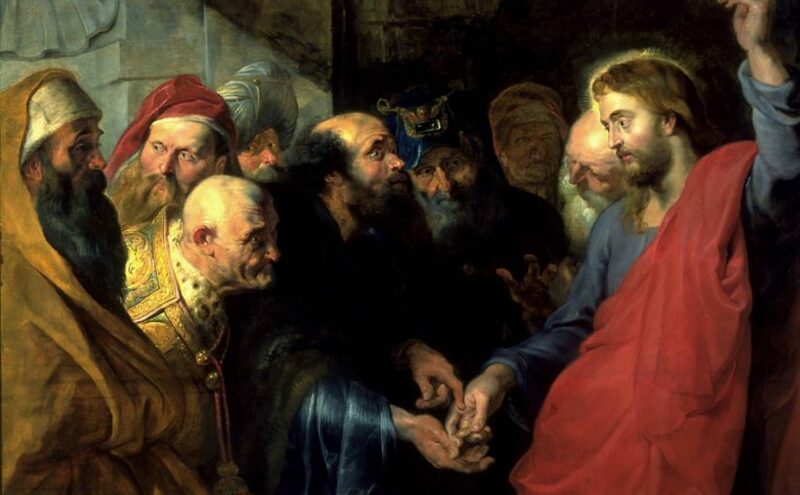 When they tried to trap Him into opposing Caesar publicly, Jesus asks them a two part question about the coin: Whose is this image and superscription? (Matthew 22:20) They answered ‘Caesar’s’, identifying the image’s likeness but only the superscription’s author. They wouldn’t dare repeat the superscription, it was bad enough that they could even produce the coin, let alone that they brought it into the temple, for it read: “TI CAESAR DIVI AUG F AUGUSTUS,” which translates, “Tiberius Caesar, son of the god Augustus, himself now Augustus.” This is the guy the religious leaders were trying to align themselves with to condemn Jesus publicly. 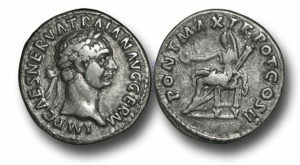 On the reverse side was the goddess of peace with the inscription “Pontif Maxim”, which translates to “high priest”; the person who gives access to god. Ironic. In the end the only begotten Son of God, King of kings, and Prince of peace was holding a little graven image with a king claiming to be the son of god and a goddess of peace claiming to be the high priest giving access to god. An entirely false thing in every way but one; it was seemingly a sound representation of the value of the Pharisee’s religious profession. 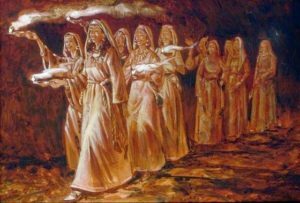 Which brings us to the parable of the 10 Virgins. 10 Virgins: 5 were wise, 5 were fools. In the upcoming chapter, Matthew 24 we have the story of the 10 Virgins. Given the context of the last two chapters consider how their lamps may represent Christian profession, symbols of their Christian faith. The five fools took their lamps, their Christian symbols but they had no oil. The oil makes the lamp work. It’s what’s on the inside. It’s what makes it all real. Having been surprised by Christ’s coming they scrambled to find oil but could not get any in time and so they were turned away. The virgins with not only lamps (Christian Profession) but with oil on the inside (real saving faith) were welcomed in. The takeaway: your faith better be real, on the inside. Not built to please men (John 12:42, Galatians 1:10). Know you are built to please God (Revelation 4:11) and live according to this truth.